SSC Exams have to be taken on a serious note by every devoted govt. job aspirant. The opportunity is big but don’t forget that the competition is even bigger. Only Effective Practice is the key to uplift your performance and get closer to the success. And when it comes to the efficacious preparation, ADDA247 steps ahead to provide you with premium study content to align your speed skills, learning process, time management and practice session in a much needed direction to make you crack every prestigious govt. exam. Speaking of an unbeatable practice required to crack SSC Exams 2018, SSC Premium 2019 Online Test Series & eBooks Package available on adda247 store at just Rs. 2,499, brings plethora of Practice Questions contained in Full Length Mocks, Topic Wise and Section Wise Tests. 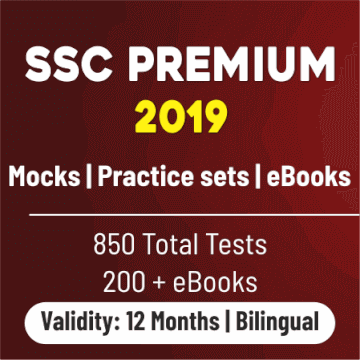 Also E-books are being provided to you in our SSC Premium 2019 Online Test Series & eBooks Package, a tool to shape your preparation into your success story. Whether it be SSC GD Exam 2018, SSC CGL Tier 1 & Tier 2 Exam 2018, SSC CPO Tier 1 & Tier 2 Exam 2018, SSC CHSL 2018, SSC MTS 2018, SSC Premium 2019 Online Test Series & eBooks Package has latest pattern exam based Mock Tests for every exam mentioned above. Also Topic wise tests include all major topics viz. Advanced Mathematics (Challenger), General Science, Indian History, Indian Polity, Geography, Economics, Miscellaneous, General Awareness Practice sets and English Language Topic Wise for SSC. Click here to get the full length description of Full Length Mocks and Topic wise & Section Wise Tests subsumed in SSC Premium 2019 Online Test Series & eBooks Package.